d5 inside/outside 00 v2 (water) was performed at Pier 40 in Manhattan, New York City. Jeremy Slater: Music Dancers: Maureen Brennan and Lisa Mercer. The Sanskrit word mandala means "circle" in the ordinary sense of the word. In the sphere of religious practices and in psychology it denotes circular images which are drawn, painted, modeled, or danced. The configuration of the circular formation is based on the idea of the mandala. The video, sound and movement is also circular. The sound is looping continuously with real-time improvised music as the loops of sound with digital delay and MIDI guitar interact to create a spiraling soundtrack. The video is a series of loops triggered by the dancer's movements. The movement by the dancers is also based on the mandala formation and is a continual attempt to maintain balance. The piece is an attempt to center-striving for the ideal image of a mandala. The purpose of the installation/ambient performance is to create an ambient performance space with performers that acts as a virtual projected/illuminatedimage which the viewer can approach and contemplate which changes gradually over time. 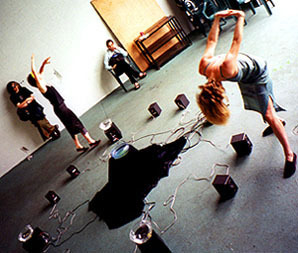 The installation/performance space should create a space for the viewer to think/meditate which is an unobtrusive and ambient space in the performance space. The piece is about the juxtaposition of an outside environment with an inside environment, an interplay of the outside ambience with an controlled inside environment with two opposing spiraling movements of dancers. The performance/installation happens live, in real-time and is informed as much by the musicians sounds and pre-existing parameters for movement as it is by the chance and ambient sounds/images from outside. The dance/movement will be in time with the music and will also be ambient. The performers should move around the installation in a first clockwise formation, and later switching to counter clockwise very slowly in time with the music. These opposing movement are representative of the opposing elements of inside/outside as well as time in it's movement clockwise and the counter movement counter-clockwise creating a visual tension. The viewer will encounter the space with spiraling performer(s) and music/sound and depending on where the person is, the music sound will change. The sound will emanate outward from the four outside speakers and inward from an additional four. As the viewer enters the center of the circle the sound again changes. The mix of the sound is dependent on the viewer's position in the space.